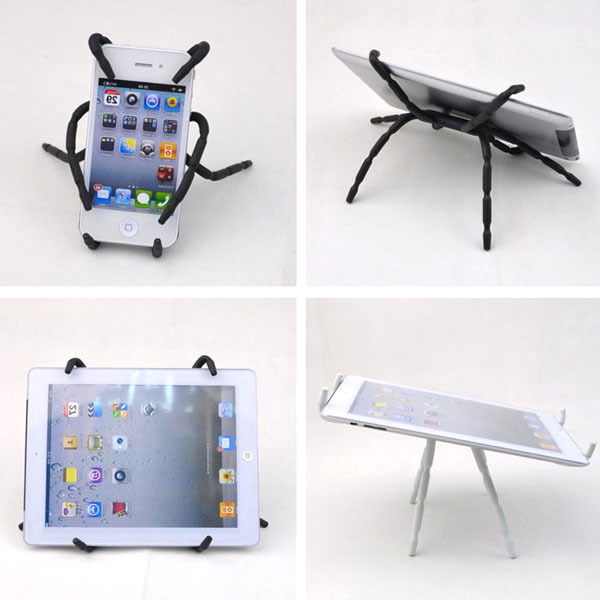 This neat little spider mount gadget holder can hold iPhones, iPads, Samsung phones and even books. 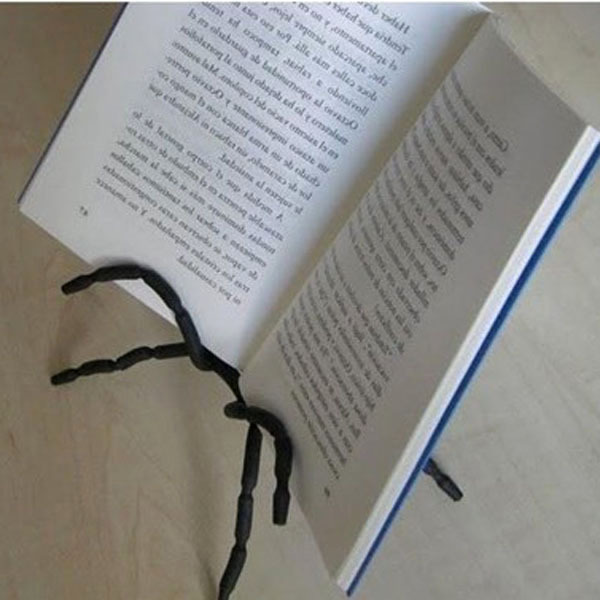 Very clever little item that is also quite simple. 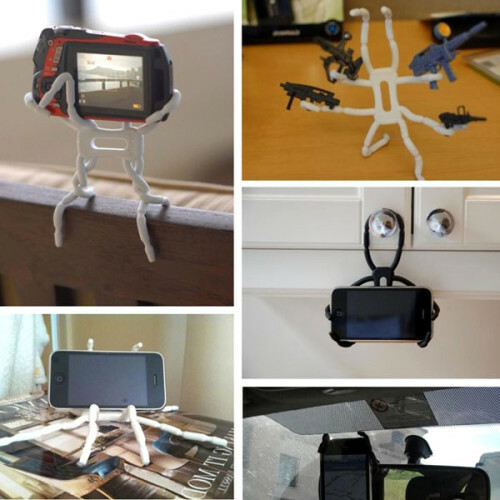 Probably the best smartphone mount possible because it can be used in the car, at home and fits in your pocket with a bit of folding. Steel wires within allow it to bend and contort to any required shape. Soft, rubbery exterior that prevents your gadgets getting scratched. Eight legs that can be put into many different shapes. It can be used in the car by wrapping into the car’s vents or around almost anything. Completely portable as it can be configured so it can stick in your pocket. 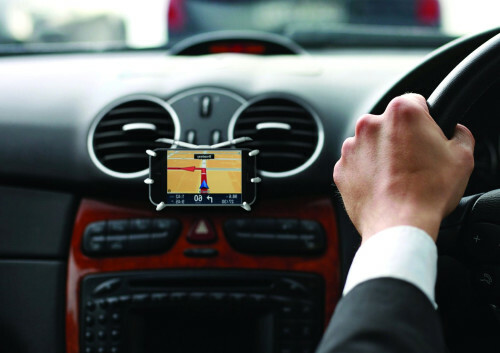 The design of the device is very simple and is an idea that should have been thought up much earlier. Basically it is designed just like those toys for children that have the wire within so you can arrange the shape of the limbs. It is a little firmer and hardier than toys are but the basic design idea is the same. It simply makes a great, cheap gadget holder that can basically be arranged to fit any gadget. 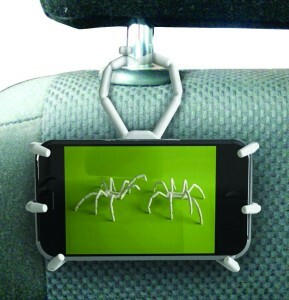 Another great feature is that it can cling and hold onto anything. It can cling to car vents, cupboard door knobs, kitchen pantry door knobs and basically anything else it can be wrapped around. It can also hold other things like books and even potentially kitchen equipment if you have the imagination to utilize it. The only real issue with the spider mount is that for some people it has proven not to last so long. While most people have strongly positive experiences a few have said that, after some use, the metal has given away. It is worth noting that this complaint is a fairly isolated one and also worth noting is that it does not break suddenly. Its something that happens as you bend and twist it back and forth. It could also be the case that those who are very rough with it might break it whereas gentler hands may not. The short version is that it is an innovative yet simple product that does exactly what you would expect it to.